A couple of years ago, she dropped a big dead branch and I noticed a hollow start to form in her trunk where the branch used to be. For ages now, her branches have been home to a pair of kookaburras, who love to sit and cackle on her branches. Sometimes, when they start up, I wander down the hill to listen to their laughter. Recently, I noticed some downy feathers around the entrance to the hollow and realised the kookaburras had started to nest there. Sometimes, I see one or other of these lovely birds fly in or out of the hollow. I can't tell if there are chicks yet. I saw an egg poised on the lip of the hollow's entrance recently, but it seemed too big for a kookaburra's. Next time I visited it was gone. Perhaps a duck had tried to take over the nest and its egg was chucked out! These hollows are a vital part of our ecosystem because native birds like our kookaburras use them for nesting. Hollows only form in the oldest trees – those that have big old branches that die and fall – and so there are fewer hollows today. It's another problem caused by our habit of clearing the bushland. 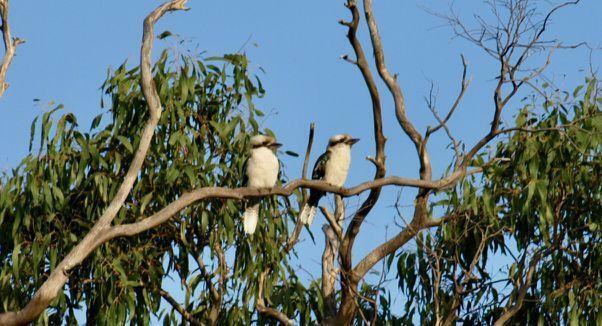 At the same time, Kookaburra numbers are in steep decline, according to a report by Bird Life Australia. I've been learning more about birds lately. I went to the first night of a course run in Dunkeld by Dr. Greg Kerr, who just moved to here to take up a job as the National Glenelg Trust's senior ecologist. The room was packed – 28 people turned up, including me. The purpose of the eight-week course is to get residential people to identify birds for bird surveys so we can help monitor and preserve our birdlife. The kookaburras are not the only ones who call our gum tree home. A pair of Corellas have nested there ever since we arrived in 2009 and for the past five years, a pair of Pardolot, a small, very pretty spotted birds have nested there too. A big flood a couple of years ago meant a whole host of seedlings grew up around the old tree, and I've been able to regenerate more bush in the flat that she occupies. She is thriving, and with her, our native birdlife. It's worth a wander down to the old gum tree when next you visit. Perhaps the kookaburra chicks will have hatched.